From the graveyards of corporate architecture to the informal settlements of Latin America. Architect and activist Teddy Cruz has been stationed along the border of the U.S. and Mexico for the past decade, traversing the territory between San Diego and Tijuana, observing the social structures and urban formations of each place. He has developed an architectural practice that is rooted in the realities of informal settlements and immigrant suburbs, and that is equally engaged with the needs—and innovations—of their residents and the exigencies of their local bureaucracies. Cruz spoke with Triple Canopy over the course of the past six months. Caleb Waldorf: You’ve been doing work on informal architecture and cross-border urbanism for many years. How has your practice shifted—or how has the relevance of your practice shifted—since the economic collapse? Teddy Cruz: I’ve always operated in the context of crisis. Over the last few decades, the physical manifestations of capital—corporate high-rises and luxury condos—have become the laboratories of the avant-garde in architecture (though calling them “laboratories” grants them too much credibility; better to call them sites of economic power that became playgrounds for architects). This was a sad thing to witness. Many of the manifestos that inspired me when I was in school in the early 80s were truly trivialized in this context. But now architects are shifting focus from those sites of abundance to sites of scarcity. places and their ability to produce and support architects. The most inventive, progressive, experimental projects have not happened in China or the Emirates (where architecture is so often treated as an object or icon), but within the context of infrastructure, in Latin America. Rede Integrada de Transporte, a rapid-transit bus system in Curitiba, Brazil. Architects and politicians such as Jaime Lerner in Curitiba, Brazil, Antanas Mockus and Enrique Peñalosa in Bogotá, and Sergio Fajardo in Medellín, Colombia, are rethinking the meaning of infrastructure on many registers: suggesting how to negotiate a new relationship between top-down and bottom-up dynamics; blending top-down industry and economic power with bottom-up social networks and activism. The idea is that urban pedagogy can generate a new type and scale—and suggest a very different kind of awareness—of infrastructure and transportation. CW: In what ways is this kind of pedagogy manifest in the “sites of scarcity” you mention? How does it effect what is built? TC: Fajardo, the mayor of Medellín, reinvented certain public spaces by envisioning them not just as manicured gardens in the leftover areas between architectural icons, but as hybrids of knowledge and leisure. He believed that public spaces could be infused with knowledge, so he invented library-parks. For him, the site of intervention was not the center of the city—that would have been the most obvious environment, and would have supported the same old economic recipes—but rather the shantytowns, where Fajardo built many of these library-parks. Mockus, the mayor of Bogotá, institutionalized a very unique form of interface with public culture as a foundation for urbanization. Without transforming the public’s image of the city, it is difficult to produce meaningful urban transformations. Mockus’ urban pedagogy elevated a sense of civic awareness and participation that paved the way for Peñalosa, the subsequent mayor, to create one of the most progressive transportation systems in the world, threading pedestrian, bicycle and bus infrastructure with libraries and public spaces. emerge from the intelligence of social networks and dynamics of informal settlements. Because of my belief in the the potential of these conditions to facilitate more experimental planning processes, I had come to be known in many circles as this “Mr. Do-gooder” architect forcing a social and political agenda. Actually, I’m not interested in the romanticization of the precariousness of the shantytown. I am simply suggesting that behind those dynamics there is a certain intelligence, from which we can harvest a more sustainable politics and economics of land use. Whether in slums or in older neighborhoods, in the United States or elsewhere, immigrants have retrofitted what are otherwise homogeneous and bland urban spaces. CW: How exactly do immigrant populations produce this new kind of urbanism? TC: In slums and other informal spaces, there are certain procedures— social, political, and economic actions, exchanges, and transactions —that suggest an alternative political economy. New economies and markets can emerge from those interactions, from within those communities, and they can provide models for rethinking the meanings of infrastructure and density. 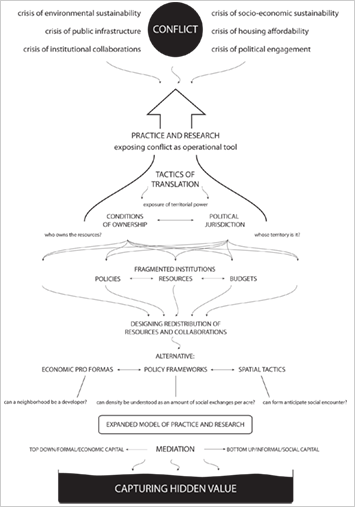 Estudio Teddy Cruz, Neighborhood Micro-politics and Economics: Strategies Between the Top-Down and the Bottom-Up, 2007. 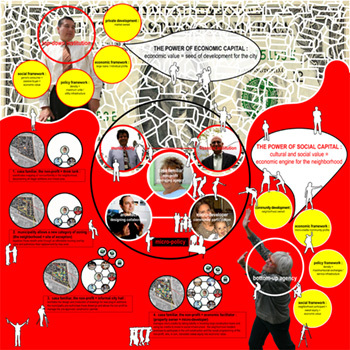 Estudio Teddy Cruz, Neighborhood Parcels: Micro Social-Economic Systems, 2007. 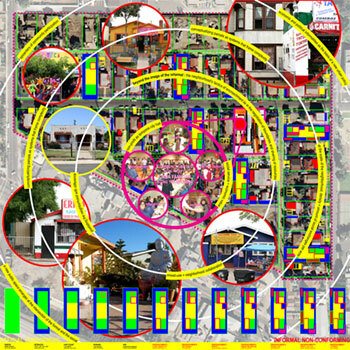 Estudio Teddy Cruz, Neighborhood Urbanism: The Informal as a Tool to Transform Policy, 2008.
property, the co-ownership of resources, and social-service infrastructure. low-interest havens strengthening our strange sense of democracy being based on the almighty right to be left alone behind a picket fence. Now the American Dream seems to have collapsed, with people losing their homes and living in increasingly marginal conditions. The need to reinvent new modes of property—and with them new conditions of ownership—is more evident now than ever before. This is not to say that we should go back to the 60s idea of co-op housing; in that model, though people share ownership of units, it remains the static ownership of things—they don't share resources or the means of production. Housing can be more than shelter; in conditions of poverty, it must be connected to micro-infrastructures and socioeconomic support systems. Housing can even be a neighborhood economic engine; it can be a site for the production of new social and cultural relations spawned by pedagogical programming carried out at the scale of the community. In other words, housing cannot be understood in a vacuum. It must be viewed as a relational tool. independently, with a DIY attitude; I find it difficult to imagine this actually happening. But given that such a possibility is fundamental to your practice, I’m wondering how you see this molecular approach becoming an institutional model—or the institutional model—for development? What are the risks of institutionalizing DIY tactics? TC: That’s something I often ask myself. We all depend on particular ideologies: you have the formalists versus the infrastructuralists, those who support largeness in architecture versus those who are interested in the micro-scale. But in Latin America, these projects actually came from the top down; progressive governments implemented them. Latin America is the only place in the world where governments have attempted to harness the potential of social networks and the dynamics of informal economies in order to rethink urbanization. I’m interested in the informal, but I’m not suggesting that it’s only interesting now that the large-scale, top-down model has failed. We don’t always have to turn to the bottom-up, DIY model. One should work on a small scale, but always with the idea of retrofitting and challenging top-down institutions. In order for these projects to produce a trickle-up effect that results in the rethinking of those institutions, they need to be reproduced and translated in different environments and at different scales. Right now, they can only be located in specific geographies. We need to develop case studies that yield models that can be tested elsewhere. 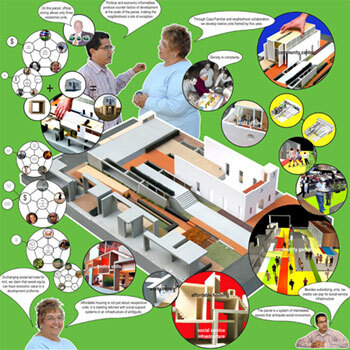 Estudio Teddy Cruz, Practice Diagram, 2008. Estudio Teddy Cruz, Non-stop Sprawl, McMansion Retrofitted, 2008. CW: What are some examples of this approach being employed in the U.S., specifically in the work you’ve done in California? 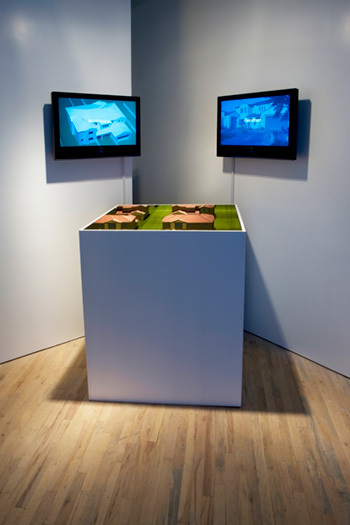 accompanied by two monitors, which display a video diptych. On one monitor, a series of immigrants talk about how they imagine transforming this McMansion to accommodate two families, or a small business in the garage. On the other monitor, an animation shows the house transforming. Originally, the project was a satirical play meant to speculate on the transformation of American suburbs. In conditions of environmental and economic emergency, the current model of urbanization is not sustainable, and alternative uses must be developed. This is not a fantastical idea: it's been happening for decades. Look at the first ring of suburbs in San Diego, Los Angeles or Chicago, and you'll see Levittown-style subdivisions that have been radically transformed in the last thirty or forty years. As immigrant communities have taken root, densities have increased and informal economic ties have grown. exchanges in an area. This invokes a very different image of the city and of the relationship between housing and the economy. different environments. When I talk about trickle-up, it’s not to suggest a homogenizing effect of the informal—or that the bottom-up model will now be the only official approach to development—but rather that we need to come up with hybrid approaches, and generate abstract frameworks and informational models. Studying the patterns of stealth urbanism found in immigrant communities can help us create policies that allow each neighborhood to take its own course of development, in accordance with its own history; that enable people to transform neighborhoods in response to demographic shifts. (I hate to call it “site-specific land use.”) I think that’s the dream of many architects dealing with these issues. I was at a talk recently where Jim Kunstler, the author of The Geography of Nowhere, observed that, because of the crisis, people today are really clamoring for solutions to some of these problems. But he also said that he was really pissed off because he feels that solutions are being sought just so that people can maintain a certain lifestyle. This isn’t only an environmental crisis and an economic crisis; primarily, it's a cultural crisis. It calls for reengaging the public and suggesting—not in a patronizing way—that people shouldn't live on the periphery and enjoy their McMansions and big lawns anymore. Given that, it’s amazing that the Obama administration is suggesting that the way to invest in infrastructure is to fix roads and add more lanes to the freeway. CW: How do you start the process of generating these abstract frameworks and information models? 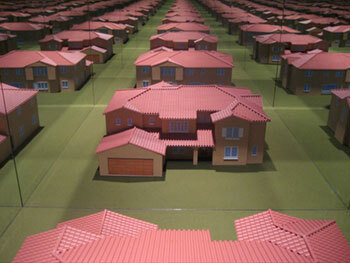 Estudio Teddy Cruz, Non-stop Sprawl, McMansion Retrofitted, 2008. 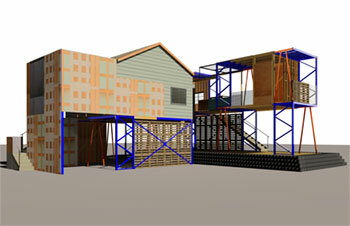 TC: Many of my studio’s projects begin by highlighting the way in which economic policies have failed. The crisis of affordable housing in San Diego is partly due to a conflict between land-use and lending. Subsidies do not support small projects or owner-occupied duplexes or fourplexes. In many depressed and disenfranchised neighborhoods, subsidized affordable-housing projects must have a density of at least fifty units; but many of those neighborhoods prohibit such a high density (as well as mixed-use constructions), so private developers are stymied. In order to come up with a different model of affordable housing, we had to rethink how tax credits and subsidies were being employed; consider how to collaborate with community-based NGO’s, which are developing many of the unconventional projects; and suggest how and why the municipality might adopt different models of density and mixed-use. We also had to convince them that social participation by people in the neighborhood has an economic value. As artists and architects, we can be contribute to the rethinking of urbanism by designing and conceptualizing political and economic processes. But without an understanding of the conditions that produced this crisis—which can themselves be thought of as the architect's material—we will just be making public art or decorating the failings of misguided planning and selfish economics. This is what I consider to be the political in art or architecture: not the production of political architecture, but the construction of the political itself, towards an architecture of social relevance. This begins by asking questions: Who owns the resources? Whose territory is this? In other words: the exposition of an institution’s mechanisms in order to show how it operates. My aim is to open up institutions, turning its mechanisms into material to be reconfigured. There’s a certain misunderstanding of the meaning of research in the context of architecture and art—a perceived separation between research and product. But the language of research can itself function as artistic material. economic development. Our research question has been this: How do you create a situation in which the local government is compelled to share its power with this grassroots organization? How do you convince this institution that such a group is well-equipped to manage resources and interpret building regulations, and that the government actually benefits from enabling it to do so? 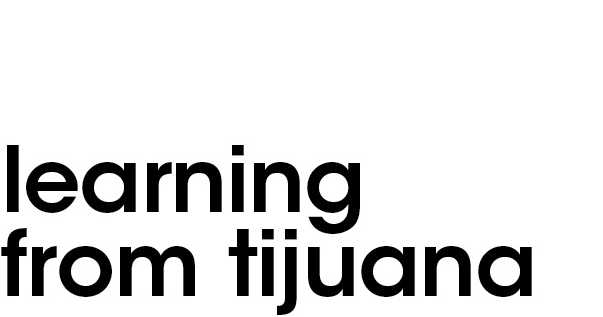 CW: You’ve been looking at barrios, nomadic settlements and informal architecture in Tijuana for many years now, taking things you’ve learned from these “case studies” and turning them into a template for people in the north to use in rethinking development strategies. But there’s a Romantic quality to this process: people come to these places to consume an idealized image of informal urbanism, and then they leave. What emerges is a sort of disaster-tourism dynamic between local residents and visitors. You run the risk of rationalizing poverty, even venerating it. Which prompts the question: What does the knowledge gained from your work do, and for whom? TC: This has been part of the criticism of my work. Since I live in San Diego, people in Tijuana see me as articulating a position in relation to the border but not engaging physically with that city. I dislike it when artists become the border patrol of ideas and authorship: I don't live there, so I’m not supposed to talk about it? Who cares where the ideas come from as long as they’re furthering the debate around the conditions of urbanity? Who cares, as long as I’m working to uncover the dynamics that exist in these places? We should all be accomplices in the construction of alternative models of development, and for this we do not need badges or nationalisms. 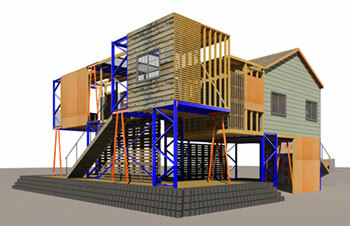 Estudio Teddy Cruz, Manufactured Sites: A Housing Urbanism Made of Waste, 2005.
awareness of the political and economic policies that produced these collisions is the first step towards fostering a more sound, functional relationship between art and the city. I’ve been trying to understand these things incrementally. As architects, we’re all impatient to build. Many of my architect friends think that to be responsible you have to pound nails. Of course, if you really just go to these places to document what’s happening, that’s not enough. 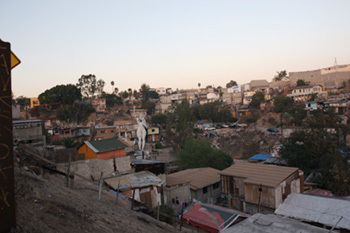 I’m documenting the environment of Tijuana, but I’m not just producing an image. I’m not interested in the image of the informal, but rather what’s behind it: the procedural, political, social, and economic characteristics of a place, and the process of translating them into operational devices that enable us to rethink urbanization. Oftentimes the role of art is only to amplify a problem, to make us "aware" of these issues, whether through metaphor or symbolism. But what happens afterward? What are the methodologies, the courses of action necessary to transcend this crisis? As the artist Tania Bruguera said to me recently: I think it is time now to return Duchamp’s urinal to the bathroom! A tour of Tijuana with Teddy Cruz, 2006.